Extra note! I’m hosting Abortion Chat on Twitter TUESDAY, February 18 at 9:15pmEST. We’re talking picketers/escorting/clinic access. Just follow the #AbortionChat hashtag and my handle to join in! Everyone is welcome and I want to hear LOTS of voices from all over North America. Today I was back in New Jersey. We had a handful of the Abolish Human Abortion picketers. A large number of them were at a conference in Philly, so we got a bit of a volume break. However, with the snowfall, the sidewalks were rather dangerous. Because only so much of that belongs to the clinic, it wasn’t completely cleared Thursday and Friday. By today, there was a significant amount of ice under the snow. This created obstacles and made further shoveling actually dangerous. The picketers were more hostile to the escorts than they have been. If you’ve seen other videos, you’ll wonder how that’s possible. They did some shouting still and calling a few of us by name. They want to intimidate us by saying they know who we are (which would be more believable if they could get my website right when they’re shouting it at me). The escalation was quieter; very direct, distinct, personal threats made in a voice that wasn’t recordable said over our shoulders. One of our male escorts listen to them plan to have him arrested, attempt to provoke contact while walking with patients and then — after he wouldn’t engage — hit him themselves. He’s a hero for standing calmly remembering that we aren’t there for the picketers. We’re there for the patients. To give you an idea what’s in the Storify and why I do it, THIS VIDEO is the worst of the day. In it, I’m standing about 50 yards from a patient (behind me) who is standing paralyzed in the street. The picketers on camera are at the door screaming at her while she cries. It was so loud on the sidewalk, it took two of our most physically unassuming escorts to explain that we were with the clinic and would protect them all the way to the door. I rarely get emotional on the sidewalk. Almost 12 hours later, I’m crying just picturing her face. And so, I give you my round up of video, pictures, tweets, audio and contributions from escorts around the country. It is long; it is hard to watch; it is its volume that makes it powerful. All of this footage was from one, three-hour shift. If this week’s post moved you, there is a way to help that doesn’t involved putting on a vest! (That is NOT something everyone should do. We do not want anyone putting themselves in a position that compromises their physical or emotional health.) 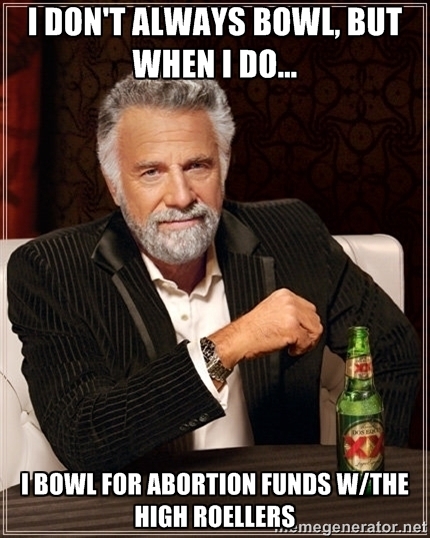 You can give to abortion funds! I am captaining the High Roellers Team and you can DONATE HERE. All the money goes to women seeking abortion through New York Abortion Access Fund, the group many will remember from the telethon I co-produced with Lizz Winstead in November for the Texas abortion groups.